Do you want a custom pen or pencil but are afraid that you will misplace it? Order a custom made desk set and display your pen at work or in your home office! Need a place to hold your business cards? These desk sets can help you with that too! Name Plate -- Add a plaque that will display your name, or any message that you would like to say. 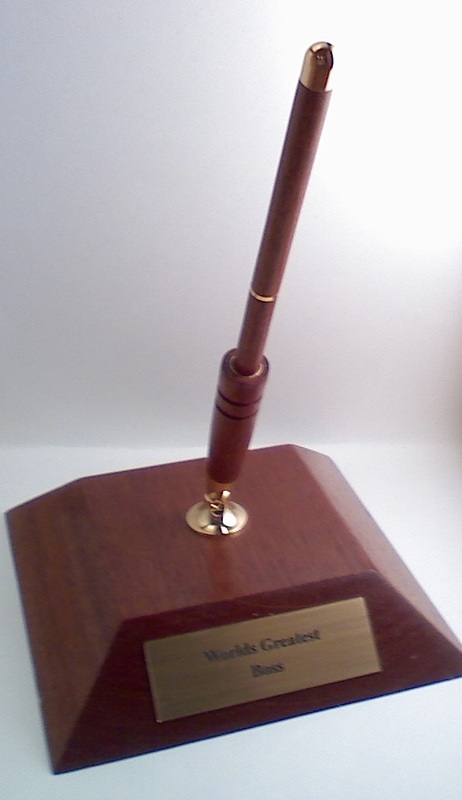 Mounted Pen -- Add a 24kt Gold Slimline pen that matches the wooden base and rests in a gold funnel to keep your pen within easy reach. Mounted Pencil -- (or Second Pen)Add a matching Gold Slimline pencil or additional pen. Clock -- Add a touch of class and sense of time with a small clock. The clock mounts to a raised platform that matches the base. Below are the pricing options for the desk set in Mahogany wood. If you would like have a desk set made in a different wood please contact us at sales as there may be a price difference or the wood may not be readily available. Please allow 4 weeks for shipping, if you require it sooner please let us know and we can try to accommodate you.